The trail ran from 19 to 27 May during which time 13 students provided advice and support to members of the public. 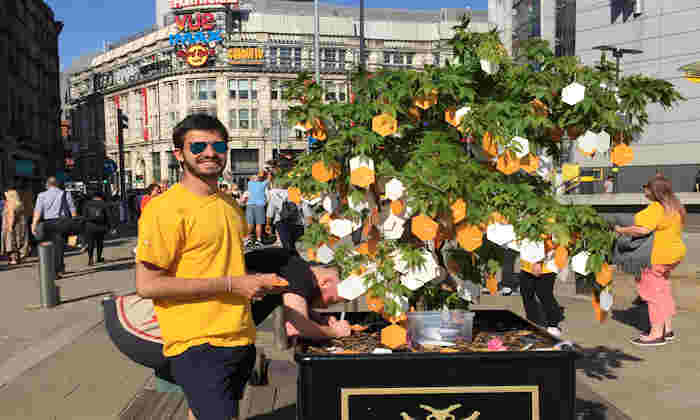 The students were on hand to help anyone who wanted to write a message on a specially designed ‘Remembering Together’ tag and hang it from one of the 28 Japanese maple trees from Manchester Victoria Station to St Ann’s Square. The messages are now being preserved and will be kept in an archive of the city's response to the attack. Another student, Jose Vinaixa, said “Volunteering at the Trees of Hope was a very positive and rewarding experience, unlike any other”. The students were joined by volunteers from a range of organisations including Victim Support, British Red Cross, Greater Manchester Fire Service, Police Cadets and the Women’s Institute.